The Fed is returning to the punchbowl. the dots dropped substantially to show no further hikes this year and only one hike in 2020. This means that the increasingly "patient" Fed is signaling that policy will remain accommodative relative to the long-run rate expectation. the balance sheet unwind will start in May and be completed by the end of September. As before, the Fed doubled down on patience and a strong desire to allow inflation to run "hot" and above the 2.0% target (it remains unclear just which inflation the Fed is targeting as tuition, medical, rent and food inflation, not to mention assets of all shapes and sizes, are already increasing at a far greater pace than 2% annually). Ultimately, as Powell said in his opening remarks, the Fed's overarching goal is to sustain the economic expansion. The latest unprecedented dovish turn "clearly shows such commitment" according to BofA's chief economist Michelle Meyer. Reinvest maturing MBS across the UST curve, not towards the front end as we expected. Cap MBS redemptions at $20 bn/month; Prepayments above this amount would be reinvested into MBS. 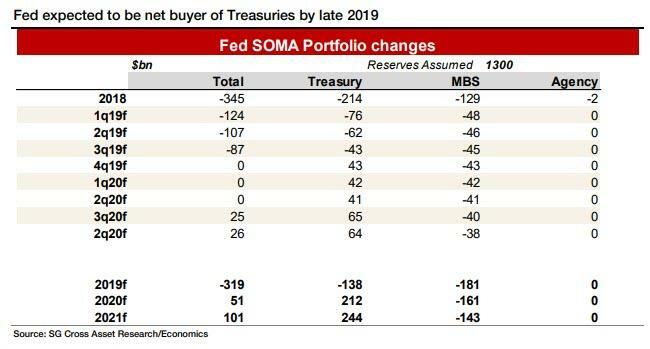 As a result of the early end to the runoff, BofA now projects that the Fed's total balance sheet size will end the normalization experiment at $3.76trillion with $1.22 tn in reserves. As a reference, the balance sheet peaked at $4.5 trillion, rising from well under $1 trillion prior to the financial crisis. While overall, the balance sheet announcements were consistent with what consensus had anticipated (would be revealed in June, with Goldman previously correctly predicting the September end date), the biggest surprise was the decision to reinvest US Treasuries across the curve as opposed to concentrating these reinvestments at the front end, meaning that there are no plans to launch a reverse Operation Twist at this time. Additionally, such a plan would only gradually reduce the average maturity of the Fed's Treasury holdings. The average maturity of the Treasury debt outstanding is about 70 months (5.8 years). Looking ahead, while the overall Fed portfolio will be flat after September, the Fed should be buying roughly $45bn per quarter to offset the liquidation of MBS. Annualized, the Fed should be a net buyer of about $180bn per year of Treasury securities. If the Treasury is financing $1.0tn deficits annually, purchases by the Fed become a meaningful source of funding, which according to Socgen "will enhance its ability to offer fiscal stimulus when or if a slowdown takes place." Finally, SocGen writes that someday, quite possibility in the very near future, the Fed will likely need to grow its portfolio again. The Fed admitted this in its update of, "Balance sheet normalization principles and plans." According to SocGen, the Fed can start increasing the balance sheet in 2H20. The growth should be accomplished with even more Treasury purchases. Does the Fed know something Others don't? The biggest question on most traders' minds (in addition to another one to be discussed below, is why is the Fed so incredibly patient? Powell shared a few reasons including i) the slowdown in growth in China and Europe, ii) the market disruptions in Q4, iii) mixed data at the start of the year and, iv) the fact that they believe that they have not met the inflation mandate. With inflation running below 2%, the Fed believes it is not meeting the mandate in "a symmetric way", i.e., it will overshoot on inflation without tightening if CPI comes in hot. The policy prescription is therefore for the Fed to hold policy and be "patient" for inflation to move up. This also means that the only gating factor for a reversal to a more hawkish Fed will be a jump in inflation, something Morgan Stanley expects will take place in late 2019 and early 2020, at which point the Fed will resume hiking an additional three times in 2020. The Fed also tweaked its projection forecasts, looking for weaker growth this year and next and a slightly higher unemployment rate. The forecast for inflation did not change as the Fed looks for core PCE to hold at 2.0% through the forecast horizon. This shows that the Fed believes that the Phillips Curve is flat, penciling in no inflation response despite the unemployment rate persistently sub-NAIRU and easy monetary policy. On financial stability risks, i.e., an asset bubble, Powell once again downplayed concerns arguing that the Fed does not see vulnerabilities as elevated. They are monitoring certain aspects of financial markets but they are not allowing it to alter their policy for interest rates. As Powell said, the key tools for managing financial stability are "regulatory" rather than rates. How regulation will bail out the financial system once this current bubble pops, remains unclear. Since this was an unexpectedly dovish statement, the reaction was abrupt and violent: the rates market viewed Fed communications, especially through the SEP fed funds projections, as signaling a very dovish stance by the FOMC. This was manifest in the rates market rallying sharply following the release of the SEP led by the front end given the expectation the Fed will not hike rates any time in the near future. In fact, the yield curve is now inverted between the effective Fed Funds rate (2.40%) all the way to the 5 Year. At the same time, the curve steepened by 5 bps between 5 - 30Y tenors given the Fed did not lower its longer-run dot but used the SEP medians in '19 - '21 to signal an undershoot of the expected fed funds rate path. Breakeven rates of inflation also rose following the more dovish Fed policy stance. Overall, today's Fed communications reinforce a view of a steeper US rates curve (which incidentally is bad news for momentum and growth stocks as Nomura's Charlie Mcelligott has been repeating often in recent months) and wider breakevens. What is surprising, is that despite the Fed's express desire to increase future growth and potentially allow the economy/inflation to run hot, the 10Y yield also tumbled, as the bond market is now growing concerned the Fed committed another policy error, with a curve inversion once again imminent. Meanwhile, as noted above, the biggest surprise was the decision to reinvest Treasuries across the curve as opposed to concentrating at the front end, suggesting greater potential for belly USTs to richen vs OIS. In the press conference there was also a notable lack of communication on any potential Fed ceiling tool. We expect the March FOMC meeting minutes to have greater discussion of such a possible tool which will likely be introduced later this year as despite the $1.3 trillion in reserves, it is all too likely that banks will find themselves starved for liquidity as the US Treasury issuance spree picks up. One place where there was no surprise is that the dollar sharply weakened after the dovish FOMC decision. According to BofA, given the possibility of an unchanged Fed this year, with external growth now showing signs of stabilization, that US growth convergence should eventually translate to monetary policy convergence as global central banks follow through with the policy normalization process. This should, at least in theory, drive the next leg lower in USD as long as global risks are contained. Yet while BofA remains bearish USD in 2019 as the topping process may now be under way, many other banks have also opined on the dollar as being very rich and yet the greenback refuses to drop appreciably, suggesting that the market is concerned that other banks may engage in even more aggressive easing as the global economy stalls in the coming months. Finally, and perhaps related to this, was the surprise reaction in stocks: after initially spiking higher, as risks always does when the Fed surprises dovishly, the market then sold off, and while the drop wasn't substantial, the fact that the day's biggest sell program hit at precisely 3:30pm and pulled stocks sharply lower, indicates that at least one player decided that - for one reason or another - the top was in. Whether that has to do with the recurrent concern of "what does the Fed know about the economy if it is doubling down on dovish", and is signaling an imminent recession, or because of growing conviction that the Fed is now powerless and has committed a policy error will be revealed in due time. However, the most disturbing feature of today's late-day selloff, is that after the aggressive seller emerged, not only major investor had the conviction to reverse the late-day drop in what appears to have been a major hit to the "dovish Fed is bullish" narrative. If today's late day swing lower is not reversed tomorrow now that traders have had time to digest the FOMC decision, it will be a concerning indication that all the market upside that can be extracted from monetary policy has now been priced in, and would suggest that another retest of the December lows would be required to force Powell to commence rate cuts or even launch QE4.